For the first time, astrophysicists may have observed the first signs of dark matter interacting — not with ordinary matter — but with itself, and not just through the pull of its gravity. 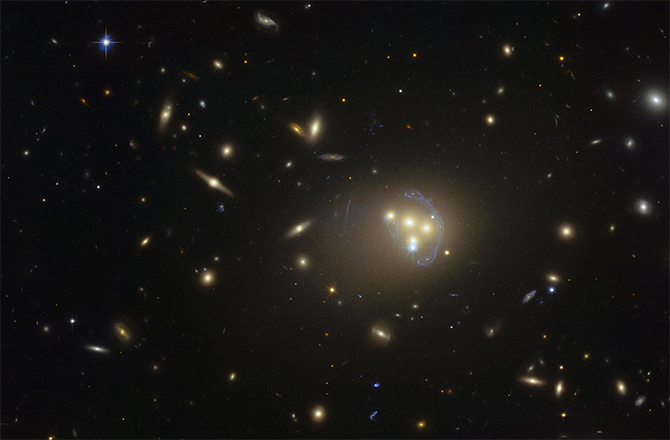 Using the MUSE instrument found at the Very Large Telescope along with images from Hubble Space Telescope, astrophysicist at Durham University studied the simultaneous collision of four galaxies inside the Abell 3827 cluster, 1.3 billion light-years away. The team noted that a clump of dark matter apparently moving more slowly than its associated galaxy, which would suggest that it was interacting with separate clumps of dark matter through forces other than gravity. We used to think that dark matter sits around, minding its own business. said lead author Richard Massey of Durham University. But if it slowed down during this collision, this could be the first dynamical evidence that dark matter notices the world around it. Dark matter may not be completely dark after all. Dark matter makes up about 85% of the universe’s mass, it cannot be seen because it does not emit, reflect or absorb light, but the team could trace out its location through its gravitational effects on stars and galaxies. We know that dark matter exists because of the way that it interacts gravitationally, helping to shape the universe, but we still know embarrassingly little about what dark matter actually is. said co-investigator Dr Liliya Williams of the University of Minnesota. In this study, scientists map out the distribution of dark matter in 4 colliding galaxies, then they deduce that dark matter clump associated with each galaxy is lagging at a distance of 5,000 light years (50,000 million million kilometers) behind the galaxy it surrounds. It sounds a long way but in cosmic terms it’s actually quite small. We were lucky to see it and it was only possible because of the power of the Hubble space telescope and the fact that one of the galaxies was perfectly aligned so that we could see the gravitational lensing effect. So, what’s causing this lag? according to this study published this week in the Monthly Notices of the Royal Astronomical Society, the lag between dark matter and its associated galaxy is caused by some kind of unknown interaction maybe a ‘fog’ of dark matter and hydrogen atoms or even some exotic unknown force, but it is clearly not gravity. This discovery only slightly moved the needle when it came to learning more about dark matter. It’s embarrassing how little we know about it. Until now, we’ve known almost nothing. As far as we could tell, it didn’t interact in any way. But there are lots of theoretical models about what dark matter might be and what it could do, and some of them did in fact suggest it would interact in certain ways. This is the first time we’ve caught dark matter in the act of doing something interesting. Our observation suggests that dark matter might interact with forces other than gravity, meaning we could rule out some key theories about what dark matter might be. The same research team recently published “Survey of 72 galaxy cluster collisions” they saw that dark matter interacts very little with itself. However, the new work zooms in at individual galaxies instead of entire clusters. The galaxy collisions observed in this study have likely lasted longer than those observed in the previous study, increasing the observation of non-gravitational dark matter interactions. both studies have provided a fascinating insight to possible dark matter interactions over two different scales. We are finally homing in on dark matter from above and below – squeezing our knowledge from two directions. Anyway, researchers note that more observations and computer simulations are needed, maybe the Large Hadron Collider second run will delving deeper into the dark matter mystery.